Zeppelins were the terror weapon of the First World War. Their bark far outreached their bite as technology advanced quickly to overwhelm their effectiveness. Combat in a Zeppelin, or in the aircraft sent to destroy them was no treat for either side. 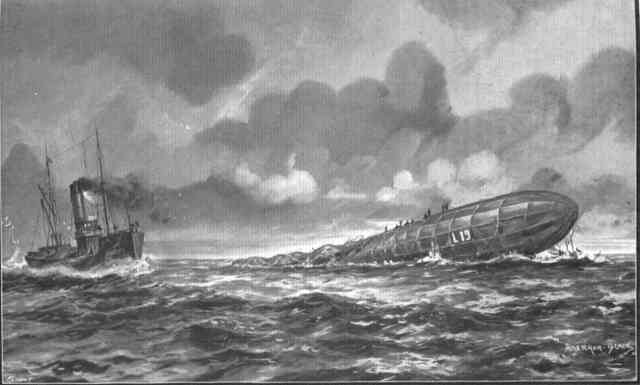 The L-19 was a German Navy Zeppelin built in 1915 as part of the first batch of zeppelins ordered after the outbreak of the First World War. Known as the P-Class, they were powered by four 240hp Maybach engines arranged in two gondolas, being 60 meters long, and capable of carrying 3500 lbs of bombs. The commander ran the ship from the front gondola, which also housed one of the engines, and a big heavy Mg-08 Maxim gun at either side. 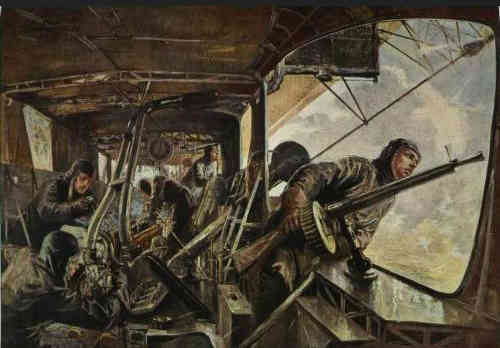 The remaining crew and 6 machine guns were in the rear gondola and a section on top of the hydrogen bag. They could cruise at 60mph at 11,000 feet. If a British plane was launched at the end of 1915 to intercept it, it would take an hour to get to the zeppelins altitude, and breathing hard. The night of 31 January 1916 was one of the largest zeppelin raids on England during the war. 9 airships attacked the West Midlands, leaving 70 dead and 100 wounded from the raid. The L-19 did little damage in the raid, being credited with wiping out an empty pub, and killing a few farm animals, possibly due to engine trouble. On the trip home, she was low over Belgium, who were really quite trigger happy, and the shot up airship finally settled down in the English Channel. Her radio was out and couldn't reach any German naval help, so the survivors climbed atop the sinking zeppelin to await their fate. They had launched a few messages in bottles, which didn't help them at all, but had been found and the last messages of the crew are in museums. A British fishing trawler, the King Stephen, happened upon the last 20 survivors, but were reluctant to take them aboard, being unarmed. The captain, William Martin, was alternately berated and evangelized in the press for leaving the Germans to their watery grave. In any event he had died within a year, the fishing boat had been appropriated by the Royal Navy and outfitted for war, was sunk by the Germans and the new captain was captured and almost hung for the zeppelin incident. War has long memories. 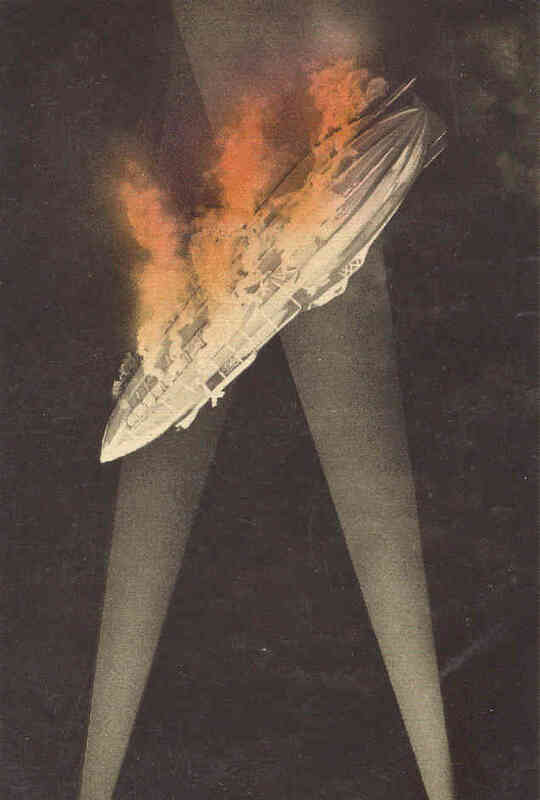 The zeppelin scourge didn't amount to much, and most of the airships, like German submarines of World War Two, were mostly destroyed during the war. A hydrogen fire at 10,000 feet was not an easy thing to survive. In a few short years, the zeppelins, which tried to rule the skies, were gone forever.